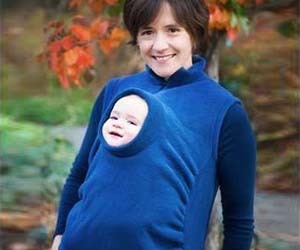 Baby Carrying Jacket – Hilarious! I had to share this. Hilarious! A gorgeously funny and charming friend of mine posted this on my FB last night. It makes me think of a cross between Predator and a distorted Telly Tubby. Its the stuff nightmares are made of! If you need a good giggle, pop this little gem into a pregnant friends Christmas Stocking! This entry was posted in Pregnancy and tagged funny, gift idea, Pregnancy by The Truth Behind the Glow. Bookmark the permalink.